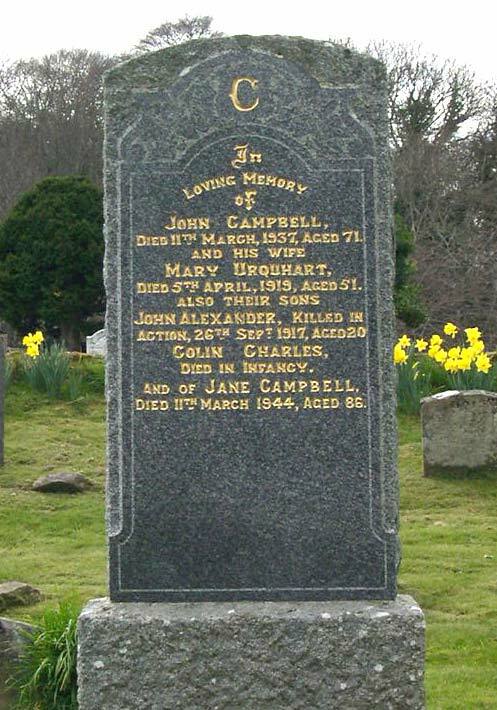 John Campbell died 11th March, 1937, Aged 71, and his wife Mary Urquhart, died 5th April, 1919, aged 51. Also their sons John Alexander, killed in action, 26th Sept. 1917, aged 20. Colin Charles died in infancy. And of Jane Campbell, died 11th March 1944, aged 86. Delighted to hear your comments - we intend to add pictures of many more memorials in Cromarty over the next month or two - this was simply one of the first. A timely addition! In the last week I have been in contact, for the first time ever, with a relative in America. Yesterday I sent him the link to The Picture Library, as he wanted any pictures of Cromarty....today he mailed me to say the site is GREAT, and that he had seen this picture! John and Mary were my grandparents, and Jane was John's cousin, who came to look after the family after Mary's death. Any relatives of Mary Urquhart please contact me. We are looking for desedents of James Urquhart who settled in Cnanda in the mid 1700's. I have reason to believe that Mary Urquhart may have been my fathers Great Aunt. Dad's Grandparents were John and Christina Urquhart (Mary's brother who emmigrated to New Zealand in 1879?) and I think Mary's parents were John and Robertina Urquhart.Robertina married for a second time to John McIntosh and lived in Jemimaville. I am desperate to hear from any living relatives as my husband and I are going to Cromarty next year, and would love to meet up with any. Carolyn, you've identified them correctly! I've e-mailed you directly with more info. Looking forward to hearing from you.